Twenty-five years after the first, and well- loved, Old Turtle, book comes this stunningly beautiful fable enriched by glorious watercolors. 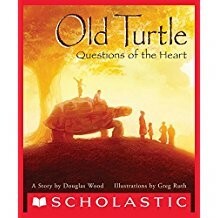 Words are few but dynamic as a group like a multi-generational family seeks answers to age old questions by first finding, Old Turtle. The entire book is a celebration of life and all it offers. Life’s meaning, its struggles and joys, its purpose and conclusion are each dealt with simply and directly. Parents and teachers will appreciate using this book to answer hard questions and librarians will have trouble keeping it on the shelves, better order two. Even the grown-ups will want to read it again and again. 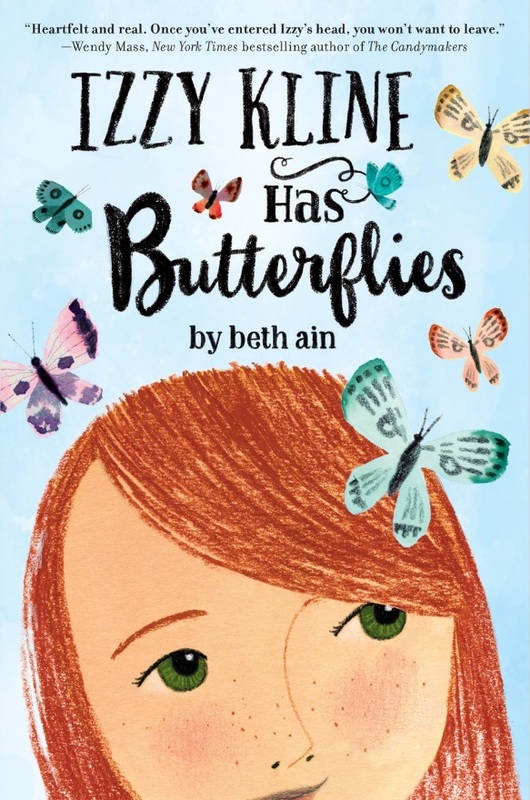 Follow a self-determined fourth grader as she deals with all the trials and tribulations of an entire school year – a year in which she learns a lot, but not always in class. Much of the story centers around the production of the play Free to Be .. You and Me. The class and Izzy spend a lot of time talking about the play, thinking about the play, and rehearsing for the play. Izzy claims not to really have any friends, so she helps form a friendless group, which she quickly on the outs with. One of those girls – Lilly with two l’s – ends up with the starring role in the play. Meanwhile, Izzy does form a relationship with another girl, Quinn, not realizing at first that this IS her friend. Though Izzy is a bit of a drama queen, she does have a lot of real issues to deal with, including an absent father and a friend battling cancer. She also learns a lot about teachers being human beings (her teacher gets married plus she loves a super substitute), about divorced dad moving on with their lives, about dealing with an older sibling, and about how FOUR ANNOYING BOYS might not be so annoying as individuals. Ain captures the voice perfectly. The verse style works well for a talkative fourth grader and should draw in even reluctant readers. Recommended for both girls and boys. Sailing the high seas with Magellan at the helm sounds exciting and eventful. And it is, but also hard, scary and very challenging. Leo, the ratter dog, tells this exciting tale while trying to stay alive and aboard himself. The captain’s mate doesn’t like Leo or the stowaway boy so they forge a friendship to look out for each other on board ship as well as on tropical islands. Storms, threatened mutiny, and severe illness plagues the trip but Magellan is determined to find a passageway between the two great oceans of the world. History is truthfully represented in this well researched story made accessible to grade two readers and those all the way into middle school. Grade five readers will enjoy it just as much while tying it to their study of the changing geography of the world. All the characters are well developed and the setting described enough for the young reader to see it all and wish the book had more chapters. The illustrations are clear in their black and white format adding to the realism of wet, dreary, scary events. But even so, there is also some humor sprinkled in. This addition to the Dog Chronicles Series will delight readers and allow teachers and librarians to explain viewpoints don’t only belong to people. 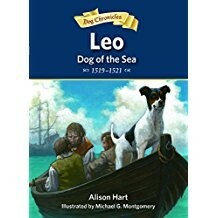 Parents can use the book to entice children who might not otherwise be interested in a historical book, but could be drawn in by a compelling dog story. Extras: Bibliography, Further Reading, Diagram of the ship of the day, Map of the Journey, author’s note and an in-depth chapter on the history behind the story. So many people make significant contributions to society, enjoy their fifteen minutes of fame, and then are forgotten. Sophie Blanchard is one such person. 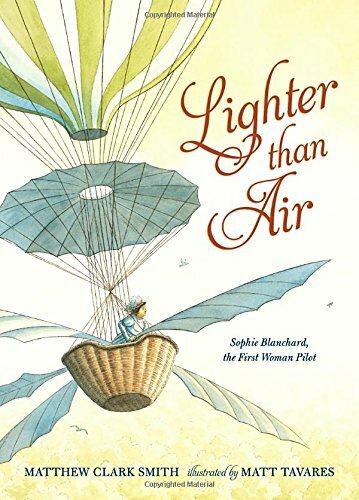 Born in eighteenth century, when women were discouraged from doing much besides keeping a house and raising children, Sophie was fascinated by the advances being made in hot air and hydrogen ballooning. She was so fascinated that she pursued a friendship with Jean-Pierre Blanchard, one of the first men to cross the English Channel by balloon. They met an air show and quickly became more than friends. Sophie rode in her new husband’s balloon a couple of times before deciding to ascend on her own, becoming the very first female pilot in 1805. Jean-Pierre died in 1808, but Sophie continued to conduct air shows and even set off fireworks from the heights. Smith makes this story as exciting as it can be for kids. In the process, he imparts many historical facts and inspires kids to pursue their own dreams. Tavares gives kids the feeling of being there – from Sophie’s seaside childhood to her appearance at Napoleon’s court. From dark clouds when Sophie mourns to bright sunshine when she becomes a pilot. Recommended for aspiring pilots and all independent kids.